Description of duties: Coordinates the inspection supervision in the area of labor, employment, safety and health at work, as well as, investigation of fatal, serious and collective injuries at work. The activities of the inspectorate are focused on repressing illicit work, reducing the number of violations of legal-work relations (overtime, payroll, various forms of discrimination), as well as, developing a modern system of labor inspection. Territorial jurisdiction : The Nišava District. Description of duties Coordinates the inspection supervision in the area of labor, employment, safety and health at work, as well as, investigation of fatal, serious and collective injuries at work. The activities of the inspectorate are focused on repressing illicit work, reducing the number of violations of legal-work relations (overtime, payroll, various forms of discrimination), as well as, developing a modern system of labor inspection. 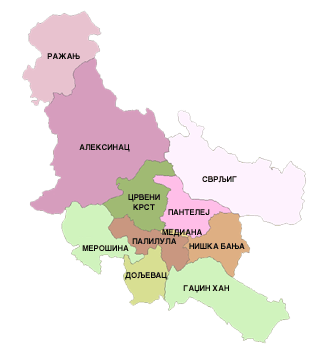 Territorial jurisdiction: The Nišava District. Territory jurisdiction: Coordinates the inspection supervision in the area of labor, employment, safety and health at work, as well as, investigation of fatal, serious and collective injuries at work. The activities of the inspectorate are focused on repressing illicit work, reducing the number of violations of legal-work relations (overtime, payroll, various forms of discrimination), as well as, developing a modern system of labor inspection.